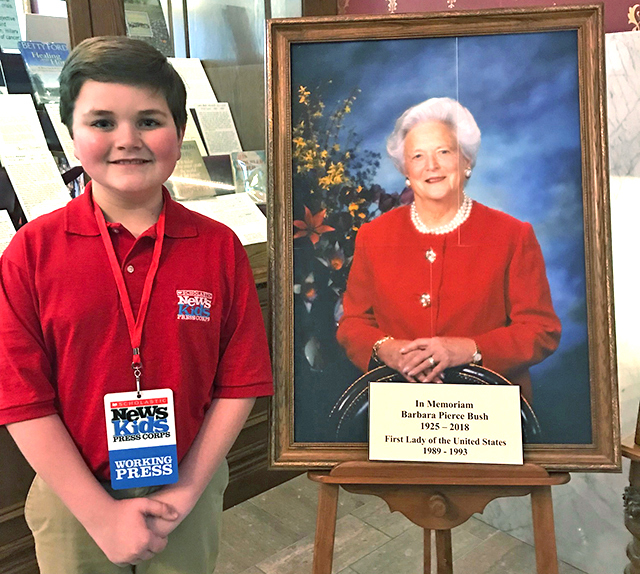 Remembering a Former First Lady | Kid Reporters' Notebook | Scholastic Inc.
Former First Lady Barbara Bush is being remembered in the United States and around the world for her public service, her dedication to literacy, and her sharp wit. The former First Lady, who died on April 17, was the wife of former President George H. W. Bush and the mother of President George W. Bush. “Barbara and George Bush put country above party, the common good above political gain, and service to others above the settling of scores,” said historian Jon Meacham at Mrs. Bush's funeral, which was held on April 21 in Houston, Texas. Mrs. Bush became the First Lady on January 20, 1989, when her husband was inaugurated as president. She is one of only two people in U.S. history to be both the wife and mother of a president. The other is Abigail Adams. Mrs. Bush’s son, George W. Bush, held office from 2001 until 2009. I recently visited the National First Ladies’ Library in Canton, Ohio, to learn more about Mrs. Bush’s life and legacy. A memorial display showcased her letters, books, and photographs. Nolan and Lucinda Frailly, director of education at the National First Ladies’ Library, hold Millie’s Book, which Mrs. Bush wrote in the voice of one of her beloved dogs. Mrs. Bush, whose husband held office until 1993, dedicated herself to helping all children cultivate a love of books, in part because her son Neil was diagnosed with dyslexia as a child. “The former First Lady was a strong advocate for children’s literacy,” said Jennifer Highfield, president and chief executive officer of the library. Mrs. Bush, she added, was quick to accept invitations to libraries and schools to read with children. Mrs. Bush even joined Big Bird on Sesame Street, a popular TV show for children, to promote reading. The former First Lady also encouraged athletes, musicians, actors, and other celebrities to spend time reading to children in their communities.